This app is more frustrating than helpful. What a disappointment to have to trouble shoot a series of things to try to get the books you’ve chosen to download to work....mostly it’s just spinning with an error and nothing is readable. I’d recommend you try another app. This is a mess. Not all libraries participate apparently. From what I did see, it looks easy enough to navigate. I really like this app because it makes my books so accessible but it’s soooo spotty. It’s really annoying. I’ll try to search by author and it just loads and loads and then it freezes. I have to close the app multiple times in an attempt to “fix” it. Please fix this bug! I’m having an issue turning pages on my iPhone. When I swipe, the app acts like it’s turning the page but actually stays stuck on the current page. It was working fine before iOS 12. Not sure what to do. I love the easy access I get with this app, and it’s helped me with me with having a book at anytime anywhere. I love it and it has a more larger library of... libraries. Only downside is that I wished the layout was more fleshed out, but it’s just a tiny nitpick. I am starting to save money. Reading is my favorite pastime. I read over 350 books last year and spent around $1500 in the process. This app has help saved me a bit of money, and it will save me a lot more once I get into the habit of using it. Also, usability/functionality is A+. I wish the app had a function so that the books you have previously read are marked somehow when you search for an author. A favorite author list would be nice too. Love that it connects to my library, but I’d give just about anything to read my checked out books in a different reader. Full page is the only option, which is difficult to read. Even the not so great readers give a double page option. Very little customization options. Please send out a new update to fix the bugs that make the app only stay on the same page when reading. It might be a problem between Apple iOS and the app. App keeps crashing when reading certain pages and after closing the app it doesn’t keep the place where it left off. When he app does work it is very nice to use, but it needs fixing. App stopped responding again. Can’t do library search and can’t return to current book. Only fix I found is to reinstall. App is constantly reformatting pages. You swipe for the next page and the content on the current changes. What a pleasure to have found this app and the ability of libraries to share their books this way! I was totally turned off by the horrible website my library had for some time. When I recently discovered this app connected to my library, I’ve been so happy to be able to find free books to read and listen to! I can carry my “book” with me anywhere via my phone or iPad. It’s just great! Thank you so very much for this service. I am housebound due to chronic illness. I thought my Library days were over. I was shown this application by a Librarian friend and I will be grateful to the end of my days! Five gold stars from this happy patron. I love that I can read so much with my library card on this app. They even have audio books for when your on the go!!! I love my kindle app, but this is free. You just need a library card! I love it! Not enough audio books. Wait times too long. I love it when I can get what I want. Concept is great. It doesn’t matter how well or badly the app works. No kindle support means no stars. I love listening to audio books on my mobile phone but unfortunately, recieve playback errors nearly every time I attempt to multitask and open another app. Really disappointed this is the option my local library has chosen. I use this app a lot to read e-books from my local library but am not impressed with the features. The scaling can be off and when I turn the page there is sometimes a continuity issue, but if I go back to the previous page the missing line of text suddenly appears. Though this app is quite handy when it comes to finding books needed for school, I have not been able to open certain titles as of lately. This is probably my favorite app ever! Linked to my local library, easy to browse or search for something specific. I'v listened to and read so many books that would've cost me a fortune to buy - and not garbage, either. Bestsellers, noteable authors, classics old and new. LOVE this app! I am finding myself unable to access my library through this app because whenever I try, it's a 502 Error. Why does this happen? I would love to read library books. This app works better for me than any other I’ve used, including Kindle. Less eye strain, better control over font size, great variety of available literature. I’ve read hundreds of books on this app, on a number of different devices, and have never experienced any technical glitch. An incredible library at my fingertips. Selection, ease of use, searching by author or genre or titles, primarily non-fiction - Cloud Library has it to the nth degree! 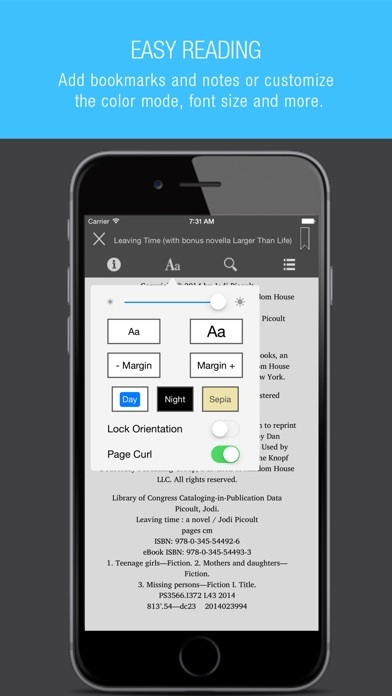 Want to capture key passages, it has a bookmark and note taking function built into the app. If you like reading ebooks or books on tape, this is the Cat's Meow! It’s really nice, but only when the book you are reading works. You may download it, but it will not allow you to read it. I don’t know if it is a glitch, but it has happened to me multiple times with many books I tried to read. It can be very frustrating. My library changed from Overdrive to Cloud Library. I shouldn’t complain about free books, but I really don’t like this app. You can even search by author. Refuses to download second time. Maddening! Has done this several times. Reading - in middle of book, then it refuses to come back when clicking on book after going to another item on iPad--never, ever happened with Overdrive. PLEASE fix this problem. Thanks. This app is so easy to use and makes reading a book easy. I like that it is linked to the Kansas Library. Keep up the good work. I’ve only tried to read two books on Cloud Library and gave up on both. I can see why it has a shorter wait list for downloading a title. The first book had problems with turning the pages. It would look like the page was turned, but it would still be the page I had just read. If I used the table of contents, I could jump to a new chapter, but on short order, if not immediately, that would lock up. I tried opening and closing the book, removing and downloading it again, but nothing worked. On the second book, I had much less trouble with freezing. It had a problem that is becoming increasingly common in various apps. A lot of different things are activated by tapping the screen, and it’s hard to predict what will happen. On the second book, when I swiped the page to turn it, as often as not, what happened is that the gray top and bottom menus appeared and cut off most of the page. I got so sick and tired of constantly having to get them out of the way, that I returned the book when I was about 20% finished. I removed the app. I’m going to get hard copy when my only other option is Cloud Library. This is without question the worst reading app I have ever used. I keep imploring our local library to use something else. Being a government entity however that will take years I assume. What happened to page turner animation? This app is frustrating to use. It is constantly losing the place I left off at and for some reason will have duplicate pages randomly. The fix they released for it only made it worse for me. I’ve been reading books on this app for awhile and it’s been great until last few updates. Now pages repeat , bookmarks Appear on several consecutive pages and my saved books section freezes so I can’t even see my list to check a book. And since the update from yesterday the page scrolling feature is nonexistent. Who is working on these updates anyway ? Not sure where else to send this in but the last update just made the problems it was supposed to fix actually start happening to my app. It was working super well and now I want to throw my phone across the room. It doesn’t respond to any actions it has the same page three times in a row and will quit unexpectedly. Extremely irate. Neat feel of flipping pages. Great browse feature. However, unable to zoom out on large pictures in graphic novel, only shows a quarter of the picture. I use the flag feature to mark books on my wish list but I am not a able to remove an individual book when I’m done. It will only let me clear the entire list. If these problems were addressed I would give them 5 stars. Doesn’t sync between devices or remember bookmarks. Really bad design compared to Apple Books and even Kindle app. Frustrating and disappointing. This app was was working fine for me until recently. Now everything is delayed ESPECIALLY the pages turning. Takes away from your reading experience when you are waiting for the new page to show! Please fix! This app has a huge problem with starting reading where you stopped. MANY times I have to kill it because it is locked up. I started bookmarking every page that I’m reading. It still cannot find that properly. They’ve added new features but fail to fix the most basic of requirements. I’d use something else but have no choice since the library uses this crap. Since this app has updated, it has been terrible. It crashes all the time. Books won’t load. Pages repeat themselves. Bookmarks aren’t kept. No content loads. Save yourself the headache and don’t get this app. It worked perfect before all these stupid updates. What was propertied to fix the problem of some books shutting down the app fixed it to ALL books shutting down the app. Please fix version 4.3.7. Looks like it has gotten better perhaps reading a book in the middle and updating threw things off. Seems to be working out now. Will update rating. Did the “page curl” function go away? It used to work on my iPad, now it doesn’t work anymore, and the option to turn it on is gone. PLEASE don’t get rid of Cloud Library. It is simple, straight forward and makes reading a pleasure. Overdrive has been a train wreck for years and as a result, I quit using it entirely. Now I am told my library plans to discontinue use of Cloud Library in favor of Overdrive!! What???? App has lots of bugs that never quite get squashed. It feels like the developers are play wack-a-mole. Squash one and a new one pops up. Now the app struggles to turn the page and frequently freezes. I’ve had this app for years and it’s a struggle but it’s what my library chose so I have to live with it. If you have to get it you have to get it but understand it’s a buggy mess. The app freezes every time I look at my flagged books. It’s been happening since the last update and happens every. Single. Time. I am like a lot of readers. Go to turn the page and it stays on that page even though it looks like the page turned. I opened a book last night to read and it did it again. I have to power down my iPad, power it back up and try to turn the page. Sometimes it works and sometimes it takes several power downs. Sometimes I give up and return the book to the library. I keep having to reinstall this app! The bookmark goes to the wrong page or the app won’t enemy open half the time! Using the app on an iPad 4 any advice? Call me crazy but I can’t find the search feature anymore. I used to search for titles or authors. Now I seem to only be able to browse. Not good at all. I love the idea of this app, however I’m constantly meeting bugs. If I have the page turn animation on I will flip the page and about 50% of the time the page doesn’t turn. Sometimes my books don’t open and there’s just a blank white screen. When I go into the bookmark menu and tap on one of the bookmarks it doesn’t always take me to that page. When I long press on a word to get a definition, it will highlight that word and then the word or punctuation after it, so dictionary definitions are useless. It won’t let me change font size anymore. I turned the iPhone auto-lock timer off from in the app but it doesn’t work, the screen will still go to sleep. It won’t save my spot in my books. Don’t go with this if you don’t have to. Amazon Kindle or Overdrive is loads better, and I’m getting physical books in place of this when I can. This is my 3rd book and every few chapters it just stops playing. Closing the app works to fix it but I hate that I don’t get a smooth listening experience like on Audible app. Plus, as an annoyance, the start of EVERY chapter is a stuttering of “Ch Chapter 8”. Why??!? Very unimpressed but like the others I’m stuck with this stupid thing due to my library changing systems. I love being able to rent audiobooks to listen to. I think there should be more options, or better format, on how to search though. Having a hard time finding specific books, or all the books in a series. I love to listen to audiobooks. 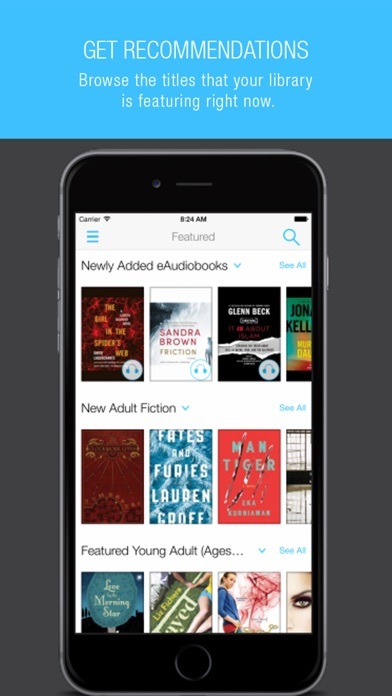 This app is great to download audiobooks. Every time I listen to a book I get Audio play back error. I have to toggle forward in book to get the book to play. It’s kind of annoying. Please fix this. Still no Kindle books. And buggy. I can’t figure out how this app possibly has 4.2 stars, since nearly every review hates it. Some sort of gaming the system, I suppose. My library used to use Overdrive. The Overdrive app itself is okay, but most of the books were available for Kindle, so I could use my Kindle for reading. This? not. It's terrible. Not even as good as the Overdrive app, with or without Kindle. The once a year I try to actually use it, it crashes. Useless. And it’s always been this way. It never gets better. I keep a library card for a city I no longer live in so that I can use their Overdrive app and get Kindle books. I hate this app. Not user-friendly, it’s user-hostile. I just started to read a borrowed library book in the app, but have paused my reading to come here and give it a one-star rating. I find the interface confusing, buggy, and (compared to the far superior Kindle app), also less attractive (though the difference is subtle). It took me a few tries to figure out how to simply highlight a passage, and another few tries to figure out how to delete the one I highlighted incorrectly. Once I did that and returned to the page, the “deleted” highlight was still there, until I closed and reopened the book. I have memberships with a few local libraries, and I ALWAYS look for the ones that work with the Kindle app, and only use CloudLibrary when I have no other option. It’s a frustrating program. First off I love that my local library system provides this for us. The only bug i have come across is the audiobooks getting a playback error. Thank you though for this! Worked fine until I updated and now I get the books downloading but not staying open. This occurred on iPhone 8 and a 2017 iPad. Pops open for a split second and then disappears. Still works on a 2012 iPad 2 which is no longer supported. Don’t know where the issue is but annoyed. Great text size and color options. I'm new to this app and couldn't be happier with it. I'm used to using OverDrive. This is quite similar. So far it has been great. I like having the books with me without lugging it around or not having my book and fining I had time to read it. The multi device is very nice. I can read on my phone on on those short moments when most times I wouldn’t even have the book with me. Good job with this app. It makes me sad that Amazon and CloudLibrary are not in relationship. I miss having a two column page when reading like a book. Hard to figure out how to get from place to place. Easy once you’ve done it several times. I have not found this format for borrowing books to be successful. The majority of the books are months from being available to use and the process of finding those that are available is so time consuming, I gave up. If possible I would rate this is a zero stars app. I may be easily impressed with things but I have never had any problems with this app. It doesn’t crash and you can easily search for things. I can usually find the book I want when other apps don’t have them. Just grateful I have this option instead of having to pay $$ for books because I read at least 5 a month. This app was specifically designed for libraries at no charge to them or library patrons unlike Kjndle/Amazon which does charge libraries for the use of that app. This helps to reduce the cost of ebooks to public libraries enabling them to purchase more hard copy books and ebooks. No, I am not a librarian, just a huge book lover who reads anything of interest and have done so for many, many years. I have found this app very easy to use and I am 71 yes. old who still reads actual books but large print books in libraries do not include a large selection due to their higher cost. This app allows me to read new books via my tablet and still allows me to check out hard copy books, too. Unlike Overdrive, there is a far greater selection of books available through this app which I, for one, really appreciate! Thank you, 3M, for creating this app for our public libraries! I really do love the app but it has a few bugs. The main one is my audiobook keeps stopping for no reason. I also play a few games while listening to the audiobook. If the game has sound, even if the sound for the game is shut off the audiobook stops playing. Otherwise great app. Has obnoxious issue where it shuts off halfway through reading a page due to “inactivity”. I’m constantly having to log back in to keep reading. No syncing across iOS devices for tracking page location, errors repeated generated on one evidence (same book works fine on other devices) with no indication of how to resolve the problem, and highlighting is a mess. Really don’t enjoy using this app but sometimes it’s the only way to get ebooks from my library. iPhone version: now with major upgrade it works the way it should. No more hang ups no more reinstalling. THANK YOU. All updates being done, I find it tiresome to try to unfreeze the page I just read so I can turn the page: returning and reborrowing are nuisances. Deleting and reinstalling the app to get back to productive reading doesn’t always work. What is going on with the app ? I downloaded this app so I didn’t have to have a physical book. It was awesome. Then a month into it I noticed that it kept repeating pages while I was trying to get to the next page of the book. I updated the app and everything was fine, for a couple days....Now it’s doing the same thing over again but this time it’s also skipping pages, sometimes when I turn the page the wording doesn’t make sense or it’s a black page or it’s the same page all over again. My old library used Overdrive, but after moving and getting a new library I had to switch to CL. It definitely lacks polish. CL is functional, but there are some areas for improvement: * As others have indicated, when pausing the audio often jumps to a different spot. * I have a tough time finding all of the books in a particular series. I’m not sure if this is a limitation of the app, or my library. * When a book is nearing its due date, I’d like to be notified and given the opportunity to renew. * The CL developers make it very clear that they don’t want feedback from end users—all comments, requests for support, etc. have to be routed through libraries. If these issues could be addressed, the app could have five stars. Glitchy and slow since the February 2019 update. 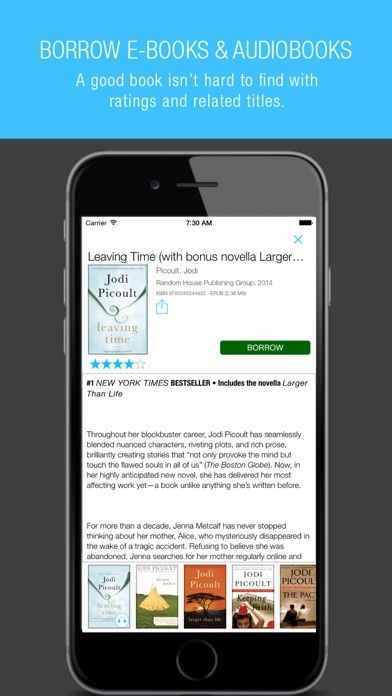 Most new book downloads fail to open the first time they’re selected, and it’s not uncommon when switching menu options for the app to simply kick you out. Have to close and reopen to get going again. Disappointing. I am having the same problem as Lapis...the book freezes on opening chapters or just freezes. I have to constantly reload the entire app. PKEASE FIX THIS! Otherwise I like the app. This apps rarely works correctly. Either it freezes and you have to get out of the app and try again, or you get an error message. Tonight’s message was about authenticating the book I’ve been reading for the last several days. Terrible app. The Axes 360 was far better. The bookmarking doesn’t work & when you return to the book you can’t find your spot. Also sometimes you turn the page but you end up on the same page over & over. Very glitchy & annoying In addition sometimes when turning a page back or forward the app crashes. Again extremely annoying and pretty much useless I now can add that I can’t read the book on my phone.. only on my tablet. This app is VERY POOR! I now read one book where everything worked...but now I’m reading Ali by Jonathan Eig and when I leave the book it doesn’t take me back to where I have put a bookmark. Ina addition the previous book would tell me how many pages in a chapter...it is a crime that you have sold this to library systems. You may provide lots of books but if reading them is frustrating and impossible you haven’t achieved a thing SOME BOOKS ARE FORMATTED PROPERLY BUT NOT ALL. THE ONLY GIRL IN THE WORLD ISNOT, why make them available when the formatting makes them impossible to read NOW I JUST BORROWED DEATH AT SEA BY AND IT SAYS I HAVE 3 days to read it!!! RIDICULOUS! And there is no way to get in touch with anyone about it! I find the app easy to use . I can make the print bigger or smaller as needed. I can easily look up word definitions, too. It’s a really great way to read books. The app regularly locks up, about every 2-3 days it simply stops allowing you to page forward or backward. This requires you to delete the app, re-install the app, and re-enter your information. Other than this continuing annoyance, I continue to generally like the app. Of course, my library allows no competition. FREE THE APP! My library just started subscribing to this service and it is a nightmare app! It is constantly getting stuck on a page and refusing to advance. Now, since I just installed the upgrade, I cannot get beyond page 85 in a book. When I try to turn the page, the whole app crashes. When it does function, it does not save my place, it will be many pages off when I open the app back up meaning that I have to waste time finding my place again. I would not suggest this to anyone. Several months since I wrote my original review. This app is a joke. I have not been able to finish a book on it in months. Huge waste of my taxes. Our library switched to this app last year and it has been horrible. The most frequent problem is the books getting “stuck” on a page. No matter how many times you turn the page you remain on the same page. I have not found a fix for this, I have to delete the book at that point. More frustrating is that these are books I have waited months or even a year for because the wait times are frustratingly long. What’s wrong with this app?! It won’t even launch! I have no choice but to use this app to read library books. Since your last update I am having a terrible time turning pages. They “roll”, which I don’t like and will often skip a page or go backwards a page. Or the app frame will come up. Please fix this! I would give it 0 stars if I could. It never remembers the page you were reading, I have to write down the page number so I can scroll to it quickly. The margins often go off the screen, so it cuts off words. I have had to delete the app and reinstall twice as it loses all of my books. If my library didn’t use it, I would delete the app and never look back. Hopefully you are lucky enough to have a library that actually cares about offering a format that you can actually read a book on. You know what’s fun? Having 2 hours left in audiobook but the app keeps shutting off. Super duper fun. PLEASE FIX THIS! I love it, but lately it has been sluggish, slow to bring up books. Also, when moving to next page it refuses to move, just brings up same page. I have to close it down and the next morning it is fine again. I use CloudLibrary all the time as I am unable to get to the library. Please fix this problem. Thank you. Freezes every time there is an update. I’ve always loved the reading app. But right now I can’t even scroll down on my flagged books to check one out much less read it. The screen repeatedly freezes. Please fix immediately. The latest update is terrible. App now unexpectedly shuts down when reading, doesn’t sync to last page read, and sometimes only shows blank pages! Very annoying! I am so annoyed with this app. Every time I opens book and try to turn the page it just keeps giving me the page I am on. It takes 3-5 times of shutting the app down and reopening it and my book before it will work right. Every. Single. Time. When I download books it also closes the app. I much prefer Libby and try to read all my books on there but my library they have different books on the apps at my library so I am forced to use this one. I also hate that I can’t take a book as being read. Developers.....please spend some time making your glitchy app worthwhile. It used to be my preferred but quite frankly it’s quite lacking. UPdate: many months later and this STILL has the same glitch. So frustrating!!!! I didn’t think this app could get any worse, but just went in after their “amazing updates”. And yep it can. What app doesn’t have search on the first page that opens up? Really wish my library would manage their budget so we could go back to overdrive. At least we still have hoopla and I might be able to use this the 2 times a year they actually have what I want and it’s available. This is why printed books will never die off completely. You recently had an update to correct frozen and repeating pages...but it certainly didn’t work for me. Hope it can be corrected “for real” very soon! I love being able to borrow books, but this is very frustrating! I use it because it's my only option. CloudLibrary is nothing but frustrating. I'm very thankful that I can listen to library audiobooks for free, but I'm really disappointed that the San Diego library switched from OverDrive to this. I feel like there is less content to listen to now - maybe that's not actually accurate, but CloudLibrary really feels like it offers less. The app freezes everytime I try to access my flagged books so I can't scroll through it to find my next book. The content library is really strangely organized into a million subcategories (which would be great as filters) that I can't seem to just group together into a 'show all'. Honestly, I had more specific complaints, but I got frustrated a few months ago and quit using the app so now I've forgotten them. I will continue using CloudLibrary but will jump for joy the day the app's UI gets better. Oh my goodness what happened to this app? I love this app & use almost daily. But i now have a problem looking up a word or highlighting a passage to research. When I touch the text it jumps. It’s driving me nuts! Please fix! I love having the option to read books without going to my library and without late fines. I’ve mostly read ebooks in this app, but often I turn a page 3 or 4 times only to end up on the same page. Usually on the 4th or 5th page turn I get the next page. This seems like an issue an ereading app shouldn’t have. App used to be great, but latest update is terrible (hard to see books/read titles when viewing on iphone, book descriptions never load when you click on a book). Please go back to original. The app freezes on pages, shows blank pages or just randomly changes pages (ex. I’ll read a page, turn the page yet its the same page with an extra paragraph or sentence at the end of the existing page). Quitting app and restarting doesn’t always fix it either. Frustrating but it’s the only app offered by my library that has the most electronic books available. I love this app! However, it’s takes more than one swipe to turn pages, never had this until did the recent update. Whenever I have a book or audiobook on hold at the library and I receive a notification that it’s available, I NEVER receive my 2 weeks loan time. I only get 5 days. That’s the time left on the hold, even though I have downloaded it to my device. It expires in 5 days...without fail. And then I go to the end of the list again if I want to finish reading/listening to the book. That’s not right. I am entitled to two weeks. I’ve contacted the library. They say it’s a 3M issue. Regardless it’s not fixed and the hold feature is useless for me. That means I can NEVER read a new book. Sometimes the app quits unexpectedly while I’m reading. Sometimes it doesn’t open or load books that I’ve borrowed. Sometimes when in the middle of a book it won’t go to the next page! I have to delete the app and reinstall it which is a nuisance. It should be a great app but .... it isn’t because often it just does not work properly. So frustrating. This new app is absolutely terrible. Please please KDL do something to have a functioning app unless your motive is to force readers to go elsewhere. ☹️ so very disappointed. Even after you put a cosmetic update out you haven’t fixed a simple bug like ‘being able to turn the page.’ This isn’t isolated to one book, or just to me. No page scrolling, just flipping (when it works) due to a lazy implementation of Adobe’s ebook reader. Please make this thing usable. This is what lowest contract bidders give you in government. This is why we can’t have nice things. I have read so many books on this app until this new version came out. Now if I’m not hooked up to good data service I can’t open the book I have checked out. I have to switch my phone to airplane mode to even open the book. Now I can’t even search books. It’s says there are no books to be searched. Please fix it. The app crashes while reading and doesn’t keep my bookmark. I love the older version of this app! Please fix it so I can keep loving it. Why can’t you just be normal?! Just got a book from my library and half the time when I swipe to the next page, it’s the same page again! That could be the book, but I doubt it. Also, half the time, when I try to go back a page it either is the same page I’m on, or if I had half swiped to peek it goes back even further each time I peek! This jumping far back through the book and not showing where I just was is definitely the app at fault, not the book. Really liking the new feature of displaying my books right on the home screen and a button to get right back to my book from any screen. Congrats to those that can download any audiobooks! I tried multiple ways to download an audiobook from the very limited selection and it won't work. It just thinks about it then takes me right back to the borrow option. This app worked originally but next time I want to start reading, the book is stuck at the beginning of chapter. Like the other reader, it can only be fixed, temporarily by deleting and then adding app, going through the annoying process or rebooting my iPad mini. Please fix this app!!! Doesn’t work half the time. Won’t move from one page to the next even after force quitting the app multiple times. Very disappointing. Recent updates have made the app very glitchy about pagination, saving stores locations, changing any settings related to font, light/dark mode, etc. I find that I often have to skip back a few pages and page forward again to catch up on a weird page jump. Switching between day and night modes often leaves a single page “stuck” in the previous mode, etc. not sure what they did here, but the simple reading experience has gotten worse, or better, in recent weeks. Ever since this most recent update each book I borrow have nothing but white pages. Please provide an update to correct this problem. With the latest update, the app is completely unusable because of bugs. I can’t check out or check in books, browse for books because they don’t display, put books on hold, or turn the page in checked-out books. I’ve contacted my library about getting these issues fixed, and now I’m reading paper library books because this app is unusable. Every time I try to browse my book list it freezes. I am on IOS. Also, it would be better if the list were arranged so the most recently added books show first. I love the app for reading but am having a hard time getting books at the moment. In general, I like the format of Cloud Library, and have found it mostly easy and simple to access ebooks from the New York Public Library. However, I use it on both my phone and iPad and most recently had an issue with being unable to download the book on the phone version. I ended up having to delete the app and re-download it. After another error, it finally worked. Hopefully these kinks can be worked out! I am shocked at the 4 star rating this app has received. Going from the amazing user-friendly Overdrive to this has been frustrating to say the least. The search options are awful. For instance, if a book (in a series) comes up as “recommended” and I tap that selection, I cannot tap on anything in the description that would bring me to other books in the series or even the author’s other books. This app is basic and unsophisticated. I miss Overdrive. Unfortunate is thebesg way to describe those of us who only have access libraries that use this app. Buggy. Slow. Crappy battery life. Inferior font choices. Read like it's 1999. Audio books don’t play. Hard to tell if you have to stream or if you can download. Documentation not helpful. I really like being able to read or listen to books for free. However, on the audio version, the sleep timer doesn’t work. So several nights, I have fallen asleep to the voice of the narrator. I have no idea how far back to “rewind”. Please fix the sleep timer!! An App that would be AWESOME... if it worked! The search engine stinks. Most of the books are audio. It takes forever to download a book. Usually, I have to wait 15minutes, then I get an error. After the error, it will download. This happens on both of my iPads, my iPhone and my kindle, and it occurs on all the networks I’ve tried, not just my home network (which is fast and I have no trouble downloading other things like video, etc.). I am comparing this to Overdrive, which had a good search engine, ebooks instead of audio, and fast downloading. The library says that most of the books that were available in overdrive are still here but that hasn’t been my experience. I am now paying another library as a non resident so that I can use Overdrive again. I didn’t just use it with my local library system...I also used it with the Midwest collaborative, which I lost when my library went to CloudLibrary. I miss being able to use the Kindle app. Highlighting is ridiculous, searching is slow, the bells and whistles just aren’t there. I do like that it’s easier to return books so now maybe people will return them faster when they are done. But I was always considerate with Overdrive and returned my ebooks promptly. The app frequently freezes & has playback error requiring it to be restarted. This application has problems operating with in car bluetooth. Autoplay doesn’t work. Constantly have to press play on screen in car to keep it playing. Unsafe for driving. Other audio book apps don’t have this problem. Wish I could check out for longer periods or renew. Search feature could be more streamlined. This app is so much better than OverDrive with all its problems/glitches. Another plus is being able to return as soon as I’ve completed reading. This is Second review, they fix the first problem. Now there are new problems. Highlighting takes long time, more than 10 seconds .Next page repeats previous page, sometimes cannot flip the page. I use overdrive to listen to audio books while I work in my studio. Several of the books I have listened to have had terrible sound quality, almost as if they were recorded on cassette tapes and then made digital. Also, there are frequently series of four or more books that overdrive has the first few in the series, but not the whole series. It seems pointless to even include them if they're not going to have the whole series. It's very frustrating to get wrapped up in a story only to realize that all the books aren't available. I love being able to download books so easily and read anywhere anytime. Suddenly the eBooks from my library are available only in this format, rather than Kindle. It was okay, definitely not great, for the first couple books I read using this app. But the search capability isn’t very useful, and the text selection ability is awful (I still haven’t been able to get copying to work at all, or to highlight or look up more than one word at a time). Now I’m trying to read a publication that has copious footnotes, which I would dearly like to read. Although they appear as blue superscript numbers, they aren’t active, i.e., you can’t tap on a footnote number, read the associated footnote text, and return to where you were in the main text. No, you have to set a bookmark for the first page of notes at the end of the book, activate the menu, select Notes/Highlights, and then navigate through to the desired numbered footnote. And then, it seems, you have to navigate, via the Table of Contents or the bottom page slider, back to the page you were previously reading. I just want to read a book! It crashes mid-book, or when I reopen a book won’t go to the next page. This app used to be fine but now it’s garbage. Fix it!!!!! I too am having the same problem. The pages won’t turn. It started 6 months ago and exiting out of cloud library then redownloading it helped, but oh what a waste of time. Now today downloading again doesn’t help, neither does changing authors. Please tell us what we are doing wrong or tell us you are aware of the problem and working on it. Hard to page forward. Doesn’t remembers your place in the book. Last time I used, it crashed and every time I tried to change pages to find my place it crashed again. This app successfully kills any enjoyment one could have in reading a book. It takes a really long time for results to show up when searching authors. Once a list of books comes up, the screen becomes frozen and you can’t scroll down or open them. I want to like this app but it doesn’t save where you left off reading and now it keeps on crashing! Frustrating. iPhone version: My books often get stuck at whatever page I last left them. I’ve reinstalled many times. There is no real support. There are video instructions and a FAQ section but that’s it. I am forced to use this but I don’t like it. Reinstall reinstall reinstall. Etc. hundred plus times. Bah! I’ve used this app for several years now. However, I just downloaded a new book and the e-book won’t progress pass the title page. I deleted the app and reloaded it and the problem still persists. Could this be caused by a bug associated with the latest iOS (12.1.1)? I’ve tried to report this bug to the developer but can’t find a way either through the app or the developer’s website to report my problem. I’ve never given a 1 star rating but for me right now the app doesn’t work. This is such a miserable app. My library makes a small selection of its ebooks only available in cloudLibrary. I dread this. The app regularly: 1) Forgets where you are in the book. 2) refuses to open a book you’re in the middle of reading. 3) Has useless appearance controls, eg the margin controls do little even as the text is jammed against the top and bottom of the screen. 4) Text suddenly reflows while you’re reading leaving you a half page back from where you were seconds before. 5) Text search function is crude. 6) Bookmarks and the ability to flip around the book is inconvenient. 7) Maps and pictures are poorly handled and all but useless. Massive improvements are needed for this be a simply adequate app. I appreciate how easy it is to search for books and select them. I like having 21 days. I wish that chapters Sprey did divided by name that just by number, since the chapter numbers given by the app do not correspond to the chapter numbers in the book. This has become buggy to the point of unusability Bug: I cannot change the margins on my iPhone SE so I have to constantly turn the page. I also had some trouble after loading my last book when I went to the table of contents and chose Chapter 1, it wouldn’t go to Ch 1. It stayed on the title page. I had to use the slider to get to Ch 1. Bookmarks are a mess. Once I bookmark a page there is a bookmark on every page afterwards. Also my last bookmark doesn’t necessarily take me to where I left off. This used to be much better. Now is is almost unusable. As soon as the book is available on Overdrive I will switch. This update doesn’t resolve a bug reported 10/17 that renders it non functional. Page slider doesn’t work. And you can’t turn the page past the chapter opening.USE SOMETHING ELSE. My library switched to cloudLibrary and it’s unusable. Before the switch I used to be able to download books to the Kindle app which worked great. Now I’m forced to use the cloudLibrary reader which will not load ePub books on the iPad. On Android it will load but doesn’t allow decreasing the large margin and will not save where I left off when exiting and going back in to the app. I’m not sure how this can be so bad and have anyone choose it over the competition. Maybe it was very cheap or free. Book will be stuck on same page unless I close and reopen. Now even that doesn’t help. I want to read a book not just page one of every chapter. Deleted and redo loaded and now giving me other errors. Completely wish my library had not adopted this platform. Pro: when I have to put a hold on a book the wait time for the book is shorter than Overdrive. Con: not as many book choices as Overdrive Bug: I cannot change the margins on my iPhone se. I have to read at a large font size and with the wide margins the column of text is very narrow. I have to constantly turn the page. I also had some trouble after loading my last book when I went to the table of contents and chose Chapter 1, it wouldn’t go to Ch 1. It stayed on the title page. I think I quit the app a few times to get it to work. My library switched to cloudLibrary about a year ago. I hope it saves them money. Simply cannot read picture books, making it unseeable for most kids books, the browse functionality uses odd categories. For example there are no books on investing in business and economics section, but are available by search, the computer and technology section full of books on backyard agriculture, the sort by most recent simply doesn’t work. I sincerely hope my library system will return to overdrive as this is simply a inferior product at almost every level. Probably OK if one does not mind rebooting every time one wants to use it. Actually, I stand corrected. Latest reboot and then a reinstall did not work. Useless on my ipad pro. Terrible app. Freezes a lot, shuts down, doesn’t properly save your place in a book. This app freezes repeatedly on my iPad. Rebooting usually does not help. Have to delete the CL app and reinstall, which means I have to dig out my library card number each time (I know, it’s lame that I can’t memorize it.) Also, cannot adjust font spacing without losing the column view. Some books have sentences packed so tightly they touch each other — very hard on the eyes to read that. I’ve had weird glitches with this app before (text size won’t change, margin size won’t change, won’t download book) but the most frustrating one I have now is the audiobook stops playing about every 4-5 minutes. It doesn’t come up with an error message, just stops playing as if I hit stop. In case you’re wondering, I couldn’t have accidentally hit stop. Also this happened 15 to 20 times, so I had lots of opportunities to trouble shoot. I’d love to just report a bug, but I can’t find where the developers allow that. So I’m left with writing a one star review and hoping the developers find the issue and fix it in the next update. Books crash, you try to turn the page and it just keeps repeating the same page. Book selection is pretty lame too. I loved the app until recently. After a few sessions the book is frozen where I left off in my ipad. BAD job people. I want to like this app, I really do. It’s pretty much my only option at my local library, but it does have a lot of books that I can’t find on other apps. I’ve been using it for a few years now because I’m terrible at returning library books, so this takes care of it for me. The problem is that it’s had the same bugs and glitches since I first started using it and they seem to be getting worse, not better. I think I gave this two stars (or maybe three) in the past because the benefits still mostly outweighed the hassle, but this is just getting more and more frustrating. PLEASE do some fixes! This app is awful. Can’t change sentence spacing. May or may not have blank pages where pictures should be. Does show you what page you are on. So disappointed that our public library chose this junk. Even Overdrive is better than this!! Same as other recent re reviewers. Crashes. I like it well enough I read a book a day. iPhone 5 no problems but this on iPhone 8 keeps crashing. And it takes me back to previous pages. Like 30 pages away from where I was. Getting to be big pain. It is crashing every couple of pages and is not syncing between devices. I ended up returning books as I could not get beyond the crashes. Devices are current with updates. For free it’s not bad. I just wish the selection was better. This app needs an option to split the page into columns likeLibby. Wish my library used the Libby app. I used to love this app, but not any more. Several times I’ve checked out books and started reading, only to have the app going into kind of an endless loop. The first page of a chapter will keep repeating. If I skip to the next chapter, I still get only the first page. Each subsequent chapter will do the same. I checked both my phone and iPad and got the same experience. Returning the book and checking it out again didn’t help, nor did deleting and reinstalling the app or restarting my device. When the app works, it is very easy to use. But the app always quits unexpectedly and when I return it keeps quitting. The only way to fix it is to redownload the app and sign in again. I have to do this at least once a day when I read. It does not always save your place either. I only use it because it’s what my local library uses. But they really need to fix this feature. Just this week, whenever open the app, it takes me to the last page I read, then when I turn the page, I get the same page again and again and again. I downloaded the app again but that’s a huge pain because then I have to re- enter all my information. There does not seem to be a way to communicate with your support team. Very frustrated.... back to iBooks I guess. Last night I finally got it to work but don’t remember how. Please , how about some tech support...? I appreciate this app and whats its done to help me get back into reading regularly, but I can’t ignore the app constantly shutting down on the same page repeatedly-and whenI open the app up I’m taken to the beginning of the book. Its really frustrating as it’s an engrossing read I cant seem to put down :/ please fix !!! I have the same problem with the app. It locks up and will not advance to the next page. All downloaded books are affected. Sometimes I can reboot my iPad and the Cloud Library app reset. Twice even that did not work so I deleted and the downloaded the app a 2nd and now a 3rd time. Takes the pleasure out of reading. I get an error every time I try to download an ebook... what happened with this app? Crashes frequently. I’m unable to view or access my flagged books at all. There’s no way to contact or leave feedback for developers. I love being able to read library books this way, but this app has major problems and it never improves. This app almost always crashes, and recently I was trying to read a book, and I was unable to read except the first page of each chapter. I restarted my phone, and then the same page kept showing, as I was unable to flip to the next page. Very frustrating. When I can get it to work, I want to read the whole book at once so I don’t lose it! Play Button Needs to Load?! First, I love that such an app exists. That being said, it drives me crazy. The Play/Pause button often needs to "load" before becoming functional, which prevents use of a Bluetooth headset or car stereo from being able to pause it. So I'm listening to my book while doing a chore, my wife comes in the room, I pause my headset, but it doesn't work, now I'm missing both what she's saying and what the book is saying while I scramble to get my phone out of my pocket, open the app, wait for the button to load, and then I hit pause. And it does that many multiple times per day. Drives me crazy. I also wish it had a 30 sec rewind option because functionally it feels like 5 sec, and it takes too long to find my place from the loading button issue. On my iPad, I cannot move beyond the first chapter of the book. Any chapter that I choose, I am stuck on the first page. I wish that there was a way to contact support rather than leaving a bad review. I continually have issues with this app. It keeps shutting down on me when I’m reading, I can’t change the super narrow margins, and it keeps going back to the same location. When I try to advance to my current location, the app closes down. I’m SUPER frustrated that I can’t read a book I’ve been waiting for and even more annoyed there isn’t a legit support contact for the app itself. When you click on the support link, it takes you to your home library. Since I can’t get help anywhere else, I’m writing this review and hoping the powers that be will see it! Quite often I have to delete the app and re-download it because when I open up the software the book only shows chapters. When I scroll to the next page it doesn’t move. Still waiting for a fix!! While I love the convenience of reading library books on this handy little app, I find it extremely frustrating as there are so many duplicate pages & repeated paragraphs. **It just keeps getting worse. It no longer keeps my place. Every time I log on I have to search for the place I left off. And the most fun feature is the app keeps closing down as I search for the page I’m looking for. Please fix!!! It used to take one tap to switch libraries now it takes three. When searching it used to remember what you were searching for when you switched libraries now you have to type it in again. Neither of these new “features” are an improvement! I have had to delete and download this app five times in order to continue reading a digital book. My book will freeze on the page and I can’t go forward or backwards and less I delete the app and download it again. Since other people are having this issue you really need to take a look at this and fix it. This is the only option I have with my library for reading digital books. I use the app on my ipad to read books all the time. Latest version of iOS and cloud library, and now the app doesn’t work properly. When I tap or swipe to advance to the next page the same page displays. I cannot go past chapter 1 page 1 on any book. Or all the letters are overlapping each other. Very frustrating. Waiting for IPhone X support. I love this on my iPad but I would love it more if it worked in my iPhone X.
I am so annoyed with this app. Every time I opens book and try to turn the page it just keeps giving me the page I am on. It takes 3-5 times of shutting the app down and reopening it and my book before it will work right. Every. Single. Time. When I download books it also closes the app. I much prefer Libby and try to read all my books on there but my library they have different books on the apps at my library so I am forced to use this one. I also hate that I can’t take a book as being read. Developers.....please spend some time making your glitchy app worthwhile. It used to be my preferred but quite frankly it’s quite lacking. I alternate between my iPhone and my Android tablet using Cloud Library to read ebooks from my public library. When changing from one to another device, the app rarely is able to find my place on the other device. Synchronization between devices could definitely use improvement. Otherwise quite useful. I love reading my ebooks on cloud library. My problem is that every few times I open the book, it shows only the first page of the chapter, and I cannot progess. I spoke with the library staff. Their suggestion was to delete the app and reload from the App Store. Of course that loses all my library data and I start again. I have done this about eight times in the last few weeks! I use a two year old iPad Pro, and the OS is always up to date. I can’t turn the page. It keeps showing the same page over and over again in iPad. iPhone version: My books often get stuck at whatever page I last left them. I’ve reinstalled many times. There is no real support. There are video instructions and a FAQ section but that’s it. I am forced to use this but I don’t like it. Reinstall reinstall reinstall. Etc. hundred times. I’ve been loving this app for several months. Recently I’ve become very frustrated by an apparently new glitch; almost every time I stop reading & bookmark a page, I discover that when I return to resume reading the book has frozen at the beginning of that chapter or on that page. I can’t continue reading unless I shut down my Apple phone, the quicker fix, or more time-consuming - delete the entire app & then download it again. That means going to my country & State & re-entering my Library card & also downloading the books again. Luckily, it does then take me back to the place in the book where I stopped reading. However it’s frustrating & time consuming. I love using an app to electronically borrow books from my library. And when I first started using Cloud Library it was so convenient & worked consistently well. Now, it’s just frustrating an unreliable. Please help. PS. I wish there was an easier way to send you feedback when a glitch exists. I talked to the reference librarian at my local library & he too has recently been having problems with this app as well, so at least I know there are 2 of us. Since there’s no way to send feedback beyond this review, I wonder if you even know there is a problem? After the app update yesterday, It crashes whenever I try to play an audiobook. The app has issues, many of which revolve around attempting to search for a book/ or author and the filter which are completely useless. This application need a better search solution, one in which you could at minimum determine searching by title, author, or keyword. The few filter settings the app includes don’t actually work, which is frustrating when I am looking for a book to read or listen to now and not in a month or 2 depending on the waitlist ahead of me. The audio book playback is marginal and often has errors while playing books. I have not had any issues with the e-reader functionality itself but it is often frustrating when attempting to actually find a book to read. This is the 3rd time the reader has frozen on me and looped me on the same page! I’ve uninstalled, reinstalled, turned my iPad off and on, and this keeps happening! I’ve liked this app up until this point. Now I’m up to 5 resets. Getting real tired of this nonsense. Now the app keeps crashing once I get to a certain page. This used to be such a great app, but the recent rash of glitches has me really annoyed! I usually don’t have an issue with this app, it could be better but it was always fine u til now. I was reading a library book when a glitch acted up, changing the margin on the pages, not picking up from where I left off, and crashing when I tried to read certain pages. It made this reading experience terrible and I couldn’t find an alternative to read this particular library book. I really hope the glitches improve soon. There’s an issue half the time I use the app, often once a day or more I have to reboot my phone because this app has either locked up or is glitchy. Where are the bug updates? Examples of glitches: page turn stops working and it stays on the same page over and over again, can’t open books, my books randomly disappear, almost always a download error pop up, and more. Major problems using the app. Keeps quitting. This app locks up continually, especially on the favorites page. The search just sits there and never returns. The few pages that do work only work if you wait at least a full minute before selecting anything next. It is the most frustrating app I’ve ever used! Every time I go on a book, I’m flipping the pages, and it’s staying on the same page. I have used this app for over a year and had been completely satisfied with it. However recently I’ve experienced an issue with moving from page to page. Sometimes the last line or two are missing from the bottom of the page and I have to fool around with it before it shows up. At other times I flip to the next page and it’s clearly not a continuation of the previous page so then I have to go back several pages and subsequently move forward to try to resync the pages. It’s very annoying and it goes without saying that this is basic functionality that is key to a reading app. Please please fix this!!! I have an updated iPhone 6. Update: several months later I continue to periodically have problems with this app. Right now I experienced an issue where I cannot turn the page in the book I’m currently reading. After trying different workarounds I deleted the app and am going to reinstall it. Why does this continue to happen with this app? I understand that it’s free, but I expect better if I’m going to use it and recommend to others. I updated the app and have attempted multiple times to change the language settings back to English, but it remains in Chinese. I’m having trouble with the book I’m reading sometimes will only show the first page of the chapters. Sometimes i delete the app and then reload it and will work fine but not always. The app loses where you are in the book constantly and will then crash at the same page repeatedly. Tried deleting an reinstalling and after a short while started happening again. It’s very unfortunate that the NYPL uses this terrible app for most if it’s ebooks. It crashes all the time, especially when I scroll fast to the page I want. I was half way through my book and couldn’t continue to read because the app kept exiting out on me trying to get to my bookmark page. I have this app because books are not always available on overdrive. App worked great at the beginning and now books take about 5 times to open, pages don’t turn. This began happening after the last update which tells me you don’t test to make sure the update works and don’t bother fixing it. iPhone version: My books sometimes get stuck at whatever page I last left them. I’ve reinstalled several times and finally it’s working but it may hang again. There is no real support. There are video instructions and a FAQ section but that’s it. Just in the past two days I’ve had to uninstall and reinstall this app as it crashes whenever I open a particular page in a book. This happened with two different books. App gets “stuck” on a page and won’t turn. I’ve tried using the scroll bar to go to a different page either before or after the page it’s stuck on, but it just goes back to that page. I also uninstalled and re-downloaded the app but it’s still doing it. It gets “stuck” for an entire day sometimes. Sometimes the app just quits unexpectedly while I’m reading. Sometimes it doesn’t open or load books that I’ve borrowed. It should be a great app but .... it isn’t because so often it just doesn’t work properly. This is the 3rd time the reader has frozen on me and looped me on the same page! I’ve uninstalled, reinstalled, turned my iPad off and on, and this keeps happening! I’ve liked this app up until this poin5. This app is super buggy - always crashing. And with the introduction of new content types, there need to be filters. The app has no support options except for a few FAQ answers. If you don’t see your problem, too bad. Now my book won’t turn pages. Everything was fine till I got to chapter 9 . Now when I turn the page it just stays there . I wish there was an option to contact support. Sad. i’ve used this for a long time and it’s been good if occasionally buggy. in the past few months it’s gotten buggier and lately the book selection is romances in all genres, even hard science SF. i select English and get English and several other languages. it has gotten very slow to respond and crashes frequently. it has crashed 8 times in the last hour! please fix this previously wonderful app. I live for this app. Try it and you will never use another. App won’t turn the page on ANY book, after repeated book downloads, deleting & reinstalling app, rebooting iPhone 7. Very frustrating- I’m 2/3 thru a book and can’t find it elsewhere. I love this app! I love getting books and reading! Thank you for getting me back to the Library! My husband thanks you as well - book budget has DRAMATICALLY decreased! Recently I have been having an issue with being unable to scroll on the My Books page on my phone. I do not have the same issue on My iPad.... this presents a problem when I am ready to choose a new book AND when I am sharing the app with a fellow reader and can’t say it’s perfect! I have deleted and re-downloaded the app bu there has been no change with this issue. Just wanted to let you guys know. CloudLibrary is a wonderful reading resource, but there needs to be more choices. Currently, there are too many audiobooks but not enough ebooks. This app was okay, but now they made some major change and most of the books that come up when I'm browsing are trashy romance novels. Categories that typically do NOT bring up that kind of book, like LIterary and Small Town. They're everywhere! I won't be using this nearly as often anymore. So disappointing! After the last update for my iPad when I open the flag screen it locks up. Need to completely close the App and then reopen it. Other then that works well. Hoping this new issue is related to needing an iOS 12 update? Seems like every other iPad app has updated. App had become buggie but this last update is a fail. Books are downloading with no content or only has a single page. Nothing seems to be working. I had this app rated as a 5 since I started using it a few years ago. I also use the Android version. I have library cards from two systems that use CloudLibrary. The new version that was rolled out in October 2018 caused me to demote it from a 5 to a 4. First, I had to re-register my two cards again. This worked properly on the iPad, but when I went to re-register it on my Android device, it crashed when I tried to re-register my second card. I will be writing a more scathing review in Google Play, probably giving it 2 stars there. Also, the process of switching from one library to another used to be just a two-touch process - one touch on the switch icon, and one more on the library name. Now, it is a four-touch process, with two additional steps to do the library switch. Please return it to the two touches. I’ll compromise and let you keep the Cancel/OK verification step if that was put in by popular demand. I like that CloudLibrary retained the rotation lock option for ebooks on the iPad. Both OverDrive and Kindle removed it when iPad added this at the device level. But sometimes I want to keep my ebook in portrait orientation but have another app I have open at the same time in landscape. One feature that OverDrive/Libby has that I’d like to see added to CloudLibrary is to be able to suspend Holds. I hate getting told that a book is ready for me to borrow at a time when I don’t have time to read it. Another great feature of OverDrive/Libby is for library patrons to directly interface with them for support and to make suggestions instead of needing to go through the library. I do enjoy the reading experience. I don’t do audiobooks, so I can’t comment on this platform. Crashes every time you hit a certain page, doesn’t pick up from where you last left off, forgets your bookmarks. I wish my library had any other app I could use. I love that I’m able to read books for myself and my kids without the hassle of carrying around the books when we are on the go or on vacation!! I still love going to the library with my kids and checking out books but love that I have this option as well!! I have read two books so far with no problem. I have borrowed a audio book but have yet had time to listen to it so I can’t speak for that part yet. I currently downloaded my 3rd book but after it downloaded I cannot get it to open. It just keeps going back to “My Books” no matter what I do. I cannot seem to find support because when I select “online support” and follow the directions it just takes me back to a suggested reading page. Wish I could figure it out because I’m really interested in reading this book tonight. I really enjoyed using the iCloud library for the past 5 years, until last week, when it no longer is letting me pull up books so I might check one out! This app must be very low cost to libraries. I would personally not used if not directly connected to my local library. The search engines are limited, the audio portion shuts down and freezes, the reading app when opened is frozen and prevents free turning pages. Both of these issues require closing and opening again. I can tolerate the search engine but later are frustrating. I would highly recommend the developers read the reviews and update as similar apps do not have these issues. I love being able to check out books via this app and read wherever and whenever I choose. Yes, the functionality is a bit limited. But so is a real book. My biggest complaints arise from the last update. The book doesn’t always load, the book doesn’t always open at the bookmark, the book will open to a random page, and each page turn returns me to that same page. All these problems require restarts. Fix these, improve navigation within the book, and then it will be a friendlier app. I’m some what happy with this app. I love that I can see my history. I to wish it had the complete series. There is a bug I’ve had on a couple ebooks. While reading offline one book continuously kicked me out. I had to return and renew numerous times before finishing it. Another book I could only read if I kept reducing the font size. I check out about ten ebooks a month; and have used the cloud app since the switch. I also had the audiobook bug issue with one book I checked out. I haven’t tried them again. Overall this has been a godsend on public transportation. I keep swiping to turn the page and it keeps turning to the same page again and again and again. Frustrated I can’t read my book. The app continues to freeze and not display the contents. I have had to delete it and start over several times. Such a disappointment compared to Overdrive - an app that libraries also use. I am not impressed! My daughter is running this on an iPad mini. The only time a book ever loads is if we delete the app and then redownload the book. Any further attempts to read the book on another day results in the message “an error occurred”. I have contacted our library and it is not their issue. PLEASE fix this. The only thing preventing my rating of five stars is this frustrating issue. Since the update the book gets stuck on a page, will only go forward or back a whole chapter. It works normally once in a while,but even turning off and on doesn’t help;. Please fix this! Well this would be a nice app if only I could get it to open. The latest update would not open so I uninstalled and re-downloaded. Now it’s hung in the midst of setup while asking me for my country. It used to work well. You can’t knock free books. However lately I have had numerous books frozen at a certain spot or spots. Deleting the app and reinstalling, deleting the book, clearing cache on the phone. Yada Yada to no avail. I am dealing with freezing, chapters that have no following pages.... Each time I have to restart the computer and HOPE it fixes the trouble. What was once a joy, Has become a task. Library told me to delete app and re-download it because a book that I started to read only had one page so I figured it didn’t all get downloaded properly. I deleted the app and re-downloaded the app and then no matter when I tried it said unable to login try again later. I tried this for 48 hours and got nowhere so now what happened to the book that I was supposed to have and also why can’t you log into the app? Latest version is buggy. Ebooks have become so popular. Libraries need to have more copies to download. The wait for new books by popular authors is too long. Has given me more options for library books. Love it. I have some trouble with the filters. I make sure only English is selected however it consistently gives me choices for all languages. It’s a bit cumbersome to go back and forth from the browse screen to home screen to filter options as well. It worked better before... also often when reading a book it will keep “opening” the same page over and over and I have to close the app and reopen it to advance my book. Sad our library switched to this buggy app. There is no way to contact the company about bugs. Now I it only gives me the first page of each chapter...pretty darn useless and frustrating. Help ... guess i should go back to the less buggy physical books. The latest version crashes constantly on my IPhone X. Previously this app has been great. This does not happen on all books. What is wrong with this! Pages repeat themselves. Same page over and over. When are they going to get it right? No trouble with sound quality or skipping. All features working well. I love it for the convenience, still needs a few adjustments. At least it’s free, but please fix it! Pro’s: It’s free Audio books work fairly well. Con’s: Very buggy. Sometime I can’t even load a book When I turn the page sometimes it takes me someplace else, either forward or backward in the book. After waiting months for a book I finally got the message, “available today,” but there was no option to download it. I kept checking back, then suddenly it changed to “available in 265 days.” Can’t access flagged books of interest. It freezes every time I try on my iPhone 7 Plus. Highlighting is extremely difficult on the 7 plus. After the latest update all my highlights disappeared. Accessing footnotes is also very difficult. Search engine very poor. Filters don’t work. When I try to search for books that are available now it shows me books that are on hold. Can’t download in kindle format. Concluding comments: I used to hope that it could catch up with the kindle app or iBook or Libby. Now I realize that will never happen. Great News though! I found out that for $50.00 per year I can sign up with a non local library that uses Overdrive, Libby and Kindle. I consider that a very small price to pay for an e-reader that actually works. Goodbye and good riddance cloud library! It is very frustrating to search for a certain author and always have to start at the beginning of the alphabet. How about letting me start at the first letter or two of author name. Overall I enjoy it. It’s handy for me to always have at least one ebook on my phone available when I get stuck waiting somewhere. I love that it’s free, but sometimes I can’t get the newest books without a little wait time, so I tend to go for books that are a few years older. It doesn’t have every book or author but when I pair it with my library system which has most hard copies, it’s a great free service overall. I understand that both Apple Books and Amazon Kindle are professional apps that generate revenue through selling books and that this is not, but still...it’s buggy, sloppy in rendering books on screen and offers far fewer display options than either Books or Kindle. Maybe the underlying technology isn’t as powerful, being pdf, but it could still be less buggy. I’m hoping it gets better because I really want it to be more useful! App is definitely buggy - refuses to go to the next page, lines appear and disappear, type is suddenly garbled. Have updated the app twice this week, problems continue. Please, CL developers, fix your potentially great app! I got an email with a link to access book on hold. Book was not in my account. I emailed CL help desk who said there are often glitches (!) & I should try my login name instead of library card number. That did not work either. The same thing happened with a second book I requested. Trying to read a highly anticipated, long queued book and finally it was available! I download it and eagerly began to find formatting issues (easy to correct), freezing (not easy to correct), and it keeps crashing (NOT ACCEPTABLE). I have been waiting weeks...WEEKS to read this book. So disappointing. Also, for audio books, every time I pause the book, it skips ahead sometimes multiple chapters! There are so many glitches, I wish my public library used a more reliable app for their e-books. This is not bad, but I really would like to scroll down the pages from both left and right just like Apple Books... much better for a smooth reading experience .. I like the app overall. It has a fairly easy interface to use, and allows for quick searching and filtering. The browsing portion gives a good customizable option, however the default sorting option often puts foreign language books at the top of the list. My main issue with the app right now is in the Flagged section of My Books. While browsing, I will flag anything I am interested in so it is easy to find later. However, often times, when I go into the flagged section to retrieve the title, the app freezes and I have to restart. This has resulted in me having to reinstall the app a few times to overcome that issue. I have an iPhone 8. This app has so many bugs that it automatically shuts down every minute. Would be great if it worked. Why am I always having issues?! This app never works for me. Whenever I get a book to borrow it never wants to download. I constantly have to delete the app and reinstall. Great concept, but doesn’t work for me. After completing 1/2 of two books, I’ve been unable to turn the pages to read the rest. Even when I return the book and borrow it again the same issue come up. Generally okay but freezes up lately. Please fix bugs! I can’t read my book these days. Great books! So easy and how I can listen to books in car or as I fall to sleep. All for free from my local library. A must have . Sure wish all books were available but I do enjoy the ones I’ve read. Very convenient! I love the convenience of not having to go to the library all the time. I read very quickly. Would like to see a more books added into library. My library switched to this app as the only way to download a book. The first step was quick and easy to get the books downloaded onto my iPad and apparently ready to read. The frustration started when book after book had the same issue. I try to turn the page and it does nothing. Totally useless unless you want to read one page books. I’m a regular reader and have very much enjoyed using the app regularly with only minor glitches until I upgraded to the newest XS iPhone. Now the app doesn’t remember me. If I try to open books from my library I get an error every single time. To resolve, I have to go into app support, choose my country, state & library. Then I enter my library card number and am taken to an entirely different user interface that actually works. The extra steps though are a pain and I’ve found I’m reading less and less because of it. If I only have 10 minutes to squeeze in a few pages it isn’t worth it. Hoping the bugs get worked out & I can go back to using it more regularly again. As others have mentioned this app has the recent problem of stopping at a page and won’t advance making it useless. Tech support is virtually non existent so it’s difficult to fix the problem. My low rating is because a combination of these two. If they had better tech support this wouldn’t be an issue. Used this app successfully for sometime. Encountering errors over the last few months: app freezing, bookmarked pages don't advance and books not opening. I have to power off iPad and restart to get app to work. I can’t read any of the books I’ve borrowed in this app. It’s buggy so you need an update to fix the issues soon. Hey, what’s happening to CloudLibrary?? The last three nights it brought me back about three chapters previous to where I was and it took forever to find my correct place—annoying! Then today, a new bug...the fonts are all messed up and can’t see all of the words on the page! Please fix it!! First review ever. First app bounces around pages. Returning books, deleting app shutting off phone does nothing to fix. Do you have corruption in files? What is in the corrupted files? Am I downloading something additional or is the app flawed. Additionally you have done away with the ability to delete these corrupted books from history? Does that mean that I have corrupted files I can’t delete from my phone? New problems and no way to contact any kind of support. Complaints can’t be sent to support. All one can do is complain to the community library and continue to add to the diary on here. These people should be ashamed. After the most recent update I can only read my books if I have an Internet connection. Since I planned to read on a recent plane trip, I was dismayed to find out that I could not open my books because I did not have an Internet connection on the plane. I have discovered that if I get my book open while I have a connection I can keep reading, but the next time I open the app I need the Internet again. This needs to be fixed so that any books you have downloaded can be read regardless of Internet connection. This app worked great until today. Now it’s crashing every 2 minutes! Ridiculous and frustrating!!! The library list is sorted in a haphazard way. Some libraries are listed alphabetically, and some are under the word “county” first. Good luck! I used to prefer this app over Overdrive. The latest update says it added a new content module but I haven’t seen new content in over a month? Am I missing something? This app is hardly worth the frustration to use it. It closes out when you try to turn the page and goes back to a different spot earlier in the book when you reopen the app and book. That is if you can even turn the pages at all because sometimes it gets stuck in an endless loop of looking like the page is turning but it’s just the same page over and over again, at which point you have to close out the app completely. I wish my library would have never switched to this app. The positives - Easy to use. Usually a shorter waiting list than overdrive. The negatives - Some new books are not available for several weeks after their release. Needs to have the ability to suspend a hold and renew a book. Formatting was better before the recent update. This is an issue on an iPad where pages overlap. Overall, I recommend the app. Update. ONLY 3 stars now! The last update created several problems. Sometimes the first page freezes and you can’t go to the next page. App does not sync to different devices. Sometimes you get an error message when trying to download the book. Frustrating dealing with this app now. Only plus is that books are available quicker than my library. Makes e-book and audiobook lending easy and accessible. I have issues with the Audio books stopping when I am driving. Which is frustrating. It doesn’t seem to happen when I listen on my headphones. But it does with the Bluetooth in my car. I was able to read one book, after that, each time I try to move to another page, I get the same page I just read. very frustrating. App says ages 4+ but your kids can get ANY book your library provides and there are certainly books with content young children should not be reading. Use with caution. The app has so many glitches!!! It needs to be fixed!!!!!! NOW!!!!!!!!!!!!!!!!!!!!!!!!!! The bookmarking doesn’t work & when you return to the book you can’t find your spot. Also sometimes you turn the page but you end up on the same page over & over. Very glitchy & annoying In addition sometimes when turning a page back or forward the app crashes. Again extremely annoying and pretty much useless I now can add that I can’t read the book on my phone.. only on my tablet. This app is VERY POOR! I couldn’t tell you how often I’ve had to delete this and then reinstall it. Because generally after using it a couple of times the page I’ve stopped at will freeze and I’ll no longer be able to advance in the book. This is ineptitude of a very high order! I have had to delete the app and reinstall because the app freezes. Just about every time I check out a book. I touch to proceed to the next page but it is stuck on that page. Very frustrating. Unfortunately, my city’s library to go with this app. It’s time for me to file a complaint with the city for their bad choice. Love this app, but today I could not turn the pages. Is the system down? First review ever. First app bounces around pages. Returning books, deleting app shutting off phone does nothing to fix. Do you have corruption in files? What is in the corrupted files? Am I downloading something additional or is the app flawed. Additionally you have done away with the ability to delete these corrupted books from history? Does that mean that I have corrupted files I can’t delete from my phone? Why did my library do this to me? Horrible app. Doesn’t remember page left off. Closes at random and then when you reopen it is not at the page where you left off. Totally unusable as a result as it ruins the reading experience. Everyone experiencing this should complain to their library, repeatedly. Make noise. Scream and shout until they either fix this piece of garbage software or they switch back to apps that actually work. Every couple days, the book I’m reading gets stuck on the same page. I have nearly memorized my library card number from having to delete and then reinstall the app so many times. I plan to contact my library and suggest they switch to a more dependable ereader app. I’m just trying to finish a book, this is ridiculous!